Open Source 3D Printers stand up to giants Stratasys and 3D Systems #3DThursday #3DPrinting #MakerBusiness « Adafruit Industries – Makers, hackers, artists, designers and engineers! Hot off the press, our November trend report sheds light on one of the biggest unknowns in 3D printing: the distribution of market share in Desktop 3D printing between printer manufacturers. With more than 1500 printers on 3D Hubs, we are one of the first to release data on the market share of the 3D printer manufacturers. 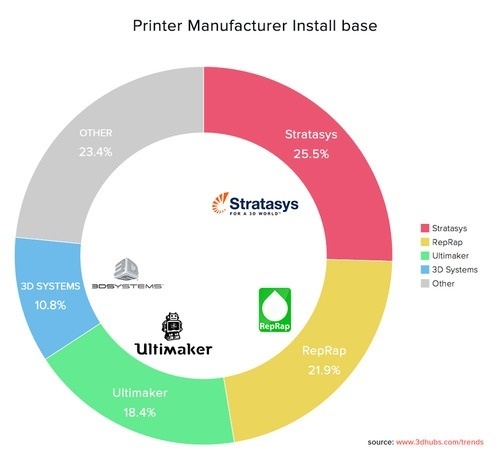 Our biggest insight is the fact that the Open Source based RepRaps and Ultimakers are both bravely holding significant market share in a market that is targeted by 3D printing giants Stratasys (5.1B USD market cap) and 3D systems (6.5B USD market cap). Stratasys is the market leader with 25.5% of the install base on 3D Hubs, due to the acquisition of Makerbot. However, RepRap and Ultimaker are not lagging far behind with respectively 21.9% and 18.4% of the the install base. Finally, 10.8% of the registered printers on 3D Hubs are made up by a range of 3D systems machines….